The past few years have seen a scramble within the power industry to use more of Utah’s natural resources for electric power production. To secure the required permits to construct proposed facilities, power companies must model emissions from the proposed plant site using current meteorological and air-quality data that are representative of on-site conditions. 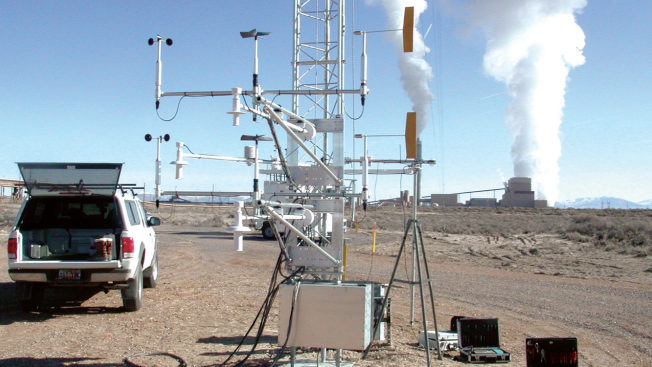 Meteorological Solutions, Inc., (MSI) installed and operated meteorological and air-quality-monitoring systems to characterize baseline conditions at proposed or existing power-plant locations in Utah. A minimum of one year of valid data is required, and strict quality-control measures are implemented to assure high data recovery. Data is collected and stored as 15-minute averages computed from 1-second values using a Campbell Scientific CR23X datalogger. A reliable land line or cellular telephone connection allows frequent interrogation of the installed dataloggers to retrieve data and confirm data validity. Campbell Scientific’s datalogger software was used for data retrieval, real-time display of numeric values, and datalogger program modifications. For all of these applications, meteorological sensors were mounted on either 50- or 100-meter towers. Wind and temperature sensors were boom-mounted on electrically powered instrument lift carriages at 100 or 50 meters and at 10 meters. This feature facilitated sensor access for periodic maintenance and semiannual performance audits and eliminated the need to climb the towers. The tower sensor configuration included 010C/020C sensors to measure wind speed and direction at 10 and 50 or 100 meters and RTD temperature probes with motor-aspirated shields at 2-, 10-, and 50- or 100-meter levels. This arrangement allowed for a variety of delta temperature calculations to satisfy different dispersion model input requirements. An LI200X measured solar radiation and a CS105 measured barometric pressure. All towers were instrumented with sensors to collect data for input into the EPA-approved ISCST dispersion model. Two towers were equipped with additional sensors to satisfy the data input requirements of the EPA-approved AERMOD and CALPUFF dispersion models. These included the HMP45C sensor for air temperature and relative humidity, the Q7.1 net radiometer, and a tipping-bucket rain gauge. Atmospheric stability was calculated using three different methods. Sigma theta (σθ) was calculated by the CR23X from 1-second data and stored every 15 minutes for later calculation of atmospheric stability using the sigma theta method. The solar radiation-delta temperature (SRDT) approach to calculating atmospheric stability required processing the 15-minute average data by MSI as did the sigma-W approach, which uses verticalwind-speed measurements. To maintain current information about site measurement systems and assure high rates of data recovery (usually greater than 98 percent), dataloggers were interrogated daily whenever possible, using either the COM210 telephone modems or a COM100 cellular phone package. After interrogating the on-site datalogger and retrieving all data stored since the last call, MSI computers in Salt Lake City stored the data. The datavalidation process was initiated when this data was automatically subjected to a series of parameter-specific quality tests using a program developed by MSI based on USEPA guideline criteria. The program generated a report identifying each value in the data file that failed one or more of the listed tests. In addition, a series of stacked time parameter plots were created so that an air-quality meteorologist could visually inspect or look for irregularities in the data, assess parameter interrelationships, and decide if corrective action was needed. If appropriate, the site technician was dispatched to the site as soon as possible to rectify the problem. As an added quality-control measure to confirm proper operation of motoraspirated temperature shields, the shields were equipped with flow switches that were interfaced with control ports on the CR23X. Whenever the flow through the aspirated shields was obstructed (e.g., by icing or spider webs), a switch connected to the control port prompted the datalogger program to increment a counter. The quality-control program registered the counts as a parameter that failed the data-editing criteria, and the site technician initiated corrective action. Quality control for atmospheric gas sampling equipment may include periodic zero, span and precision checks. The checks can be activated by the CR23X control ports connected to an A21REL-12 relay driver and interfaced with the gas analyzer calibration system. Gas analyzers and calibrators with RS-232 connections to their microprocessors allow remote access via modem to their systems. At one air quality monitoring station, MSI used a code-activated switch for selectable telephone access of not only the CR23X but the gas monitoring equipment as well. This feature allowed realtime communication with the analyzer to view diagnostics and troubleshoot problems remotely. William J. Hauze, Meteorological Solutions, Inc.